We meet Demeres as a young girl, fascinated by the priestesses of Athena who live at the temple on the hill and train with swords, bow and arrow, and other weapons. She hears the call and makes the challenging journey to the temple, where more tests await to discover if Athena accepts her. She makes friends with the other priestesses, who soon realize that she is special. This doesn't sit well with the High Priestess, who feels her power threatened by the newcomer. But the sisters know the truth, and support each other, and a new ending for Medusa's story is written. This entire story plays out on Illusion's stage without the usual help of sets and props; the six women create the entire world of the play on a bare stage, aided only by the hauntingly beautiful soundtrack (composed and performed by Walken Schweigert on guitar, fiddle, voice, saw, and other instruments). TLA core ensemble members Adelin Phelps, Allison Witham, and Heather Bunch combine with TLA newcomers Cristina Florencia Castro, Natavia Lewis, and Siddeeqah Shabazz to form a true ensemble that not only performs but helped to create this piece in the devised theater tradition. All play multiple characters, distinguished by differences in voice or body carriage, as well as trees, owls, bridges, and anything else needed to color the world. They gracefully spar with imaginary weapons (fight choreography by Annie Enneking). It's truly unique and completely mesmerizing to watch. Director Isabel Nelson says it best in a note in the playbill: "With this show, our hope is that by investigating and embodying these dark realities, we can find together a path towards light, towards doing better, towards standing unequivocally with survivors and those who speak out, towards building a world where we uplift each other and truly find our strength is our sisters." Merriam-Webster defines "devout" as "committed or devoted to religion or to religious duties or exercises." At first I thought that referred to the priestesses' devotion to the goddess Athena. But after seeing the show, I think it means their devotion to each other. This show calls, specifically, for women to be devout in their support and lifting up of each other. 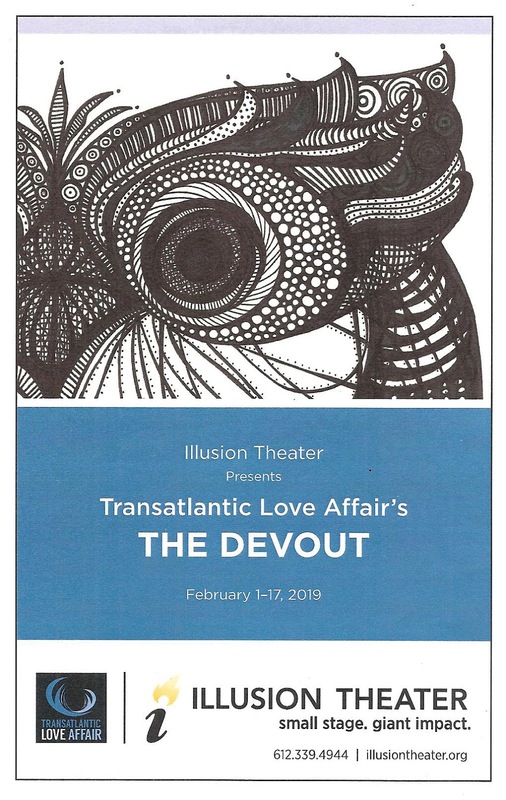 The Devout continues through February 17 at Illusion Theater on the 8th floor of the Hennepin Center for the Arts building in downtown Minneapolis.